AllegroMedical.com presents The Special Tomato® Soft-Touch™ Sitter Seat - Seat And Mobile Base - Size 5. The Special Tomato® adaptive seating systems are available in various sizes, colors and modular offerings. The largest adaptive seating from Special Tomato® is found in the size 5 Soft-Touch™ Sitter with Mobile Wedge Kit and suitable for children 13 - adult. 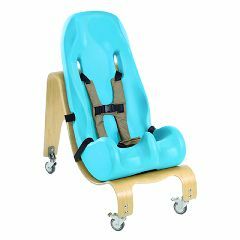 This seat can accommodate weight up to 200 lbs, holding any child, teen or adult with mild to moderate physical involvement. The Special Tomato® Soft-Touch™ Sitter is accompanied by the wooden Mobile Wedge. This Mobile Base allows children and adults to get from point A to point B by themselves. The easy rolling casters provide this function. Weight capacity: 90-200 lbs.